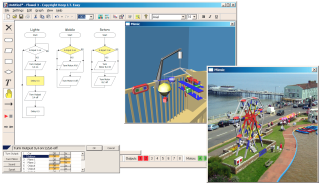 The Flowol program teaches computer programming by using carnival rides (mimics), as tools. Students develop the flowchart for various carnival rides to make them run successfully. By doing this, they learn the skills of computer programming. When done, they can apply these skills to program a real robot in the classroom. Pros: Students enjoy learning the sometimes dry topic of computer programming using this fun approach. Some students will try to crash the rides, but this is not a problem—it actually teaches more programming! The program also meets some ISTE standards. Overall evaluation: Teaching computer program can be boring. This is a fun way to show student how a computer program is assembled and then let them try it out in a “real” world environment to see if it works. Retail price: $450 school license per module.